Let’s face facts – Rachel and I don’t go out nearly as much as we used to before we had kids, and now that we have two, expect that frequency to dip even further. 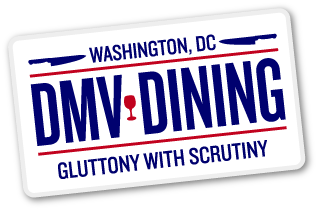 But then there’s the sacred “date night”, a time where Rachel and I hire a sitter, have a glass of wine, and enjoy each other’s company at a restaurant that’s either a staple of ours or has garnered some recent buzz. Tail Up Goat, which opened earlier this year amidst much fanfare, boasts staff from the outstanding Komi and, perhaps one of my favorite restaurants, Little Serow. Located in Adams Morgan, Tail Up Goat is situated in the ground floor of a The Adamo; a condo building I didn’t even know existed that demonstrates how long it’s been since I’ve last visited this particular D.C. neighborhood. We kicked off the evening with the Stracciatella. 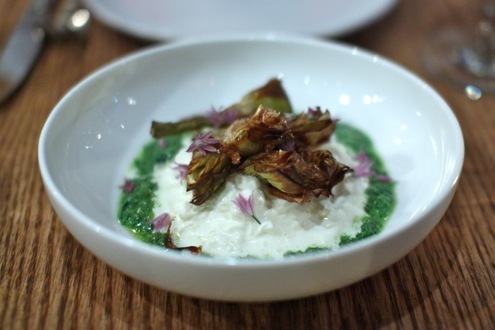 The texture of the cheese resembled that of burrata, but was even creamier, and was accompanied by crispy artichokes and salsa verde. It was a very pleasing summer appetizer. Up next was arguably the most unorthodox dish of the night – the charred chocolate rye. 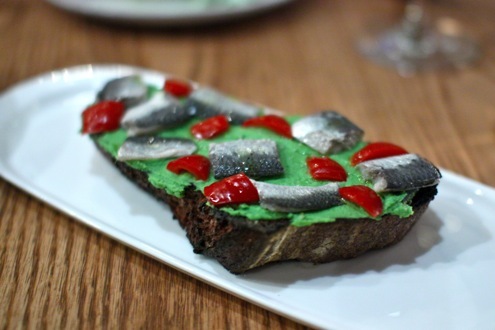 The freshly baked bread was generously smeared with a pea pesto and then topped with pickled tomatoes and salt-crusted sardines. Yep, sardines. There was a lot going on with this dish, and while I appreciate how the kitchen tried to create a balance of sweet and salty, the complexity of flavors was slightly overkill. 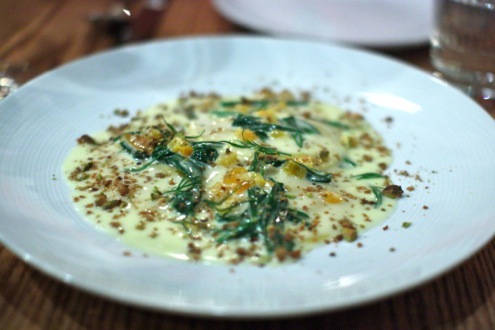 On the other hand, the carrot ravioli demonstrates how Tail Up Goat excels in its pastas. 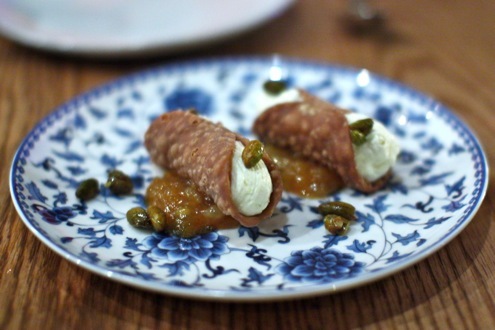 The carrot-stuffed pasta, accompanied with baby leeks, apricots, and topped with pistachio breadcrumbs, was one of our favorite dishes of the evening. Just an incredibly unique dish that was perfectly executed. 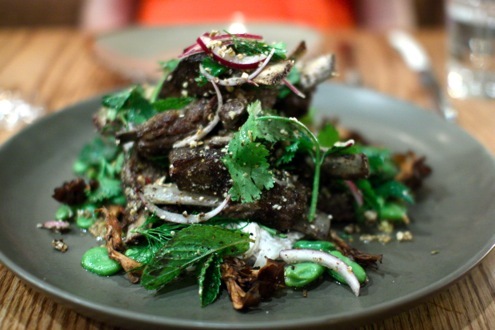 And then that brings us to the crown jewel of Tail Up Goat: the lamb ribs. Quite reminiscent to the family-style main event goat platter at Komi, the ribs are meant for sharing, and Rachel and I went to town on this Mediterranean-style dish, complete with sumac onions, beets, and a wonderful yogurt sauce. Between the incredibly tender meat and generous portion (roughly 8-9 ribs), the visit is worth it alone just for this entree. Trust me. For dessert we decided to order a pair of lemon curb-stuffed cannoli. Topped with pistachios and placed on a dab of citrus marmalade, it was a playful interpretation of the classic Italian dessert. Another highlight of the meal was the outstanding service. You could tell that the staff was disciples of Johnny Monis’ attention to detail, from the food, to the atmosphere, right down to the interaction between waiter and customer. Our server was incredibly helpful, attentive, and just all around pleasant. I’m glad we had the opportunity to enjoy one of the rare nights Rachel and I get out at an establishment like this.